Gorgeous religious art for the collectors and enthousiasts. In antiques it very often is the case that how older the piece is, the better the quality and the details. 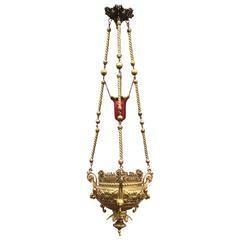 This early, rare and decorative Gothic style chandelier is no exception to that rule. This bronze & brass chancel light comes with three amazing, gilt bronze winged angels in prayer. The serenity and devotion that they radiate certainly is worthy of a church altar piece like this. The three gilt angels holding the scrolls at the lower part of this religious eyecatcher are perfectly hand-crafted out of bronze and beautiful to look at also. The original and also impressive chain and canopy are in excellent condition as well and together they make this majestic and meaningful lamp a treasure to look after and a joy to look at. Our price for this rare antique includes perfect packing and also worldwide delivery from our store to your door in just 4 days. Maximum height x diameter: 69 x 31 inches. Height without the chain/canopy: 31 inches. We have a passion for the unique, for quality, for stylish yet practical and for craftsmanship of years gone by. Your purchases will be extremely well packaged and we look forward to serving you (again). You can shop all our 1000+ listings by pushing the button that reads 'View All From Seller'. Two similar English Gothic Revival style (19th century) bronze doré six-sided filigree sanctuary fixtures. Priced each. Italian Renaissance style (19th century) bronze doré filigree sanctuary fixture with four griffin supports.